There are no second opinions to the fact that not many people (if any) enjoy traveling with heavy and bulky equipment. People generally prefer traveling light to make the most of their time in a new destination. Besides, when you’re traveling, every pound is important and needs to be taken into consideration. However, there aren’t a lot of people that would be ready to settle for pictures of poor quality as their only documented memories of the time that they spent in a new destination. Whether you’re a professional travel photographer, or someone who enjoys a casual vacation every once in a while, you know how important good pictures can be—especially when you’re having the time of your life. And we all know that if you really want tack sharp low-light professional pictures of your favorite vacation memories to share with your loved ones on social media, then you can’t do without a DSLR and tripod. Using a tripod with your camera will help you take pictures that look more professional and will also ensure that your low-light shots aren’t blurry—all while capturing the beauty of your travels. However, much like any photographer and traveler, we understand that you probably have a few questions about what makes the best travel tripod. You are probably concerned whether or not the tripod will fit in your luggage, whether it is too heavy to carry around, or even how durable and sturdy it is. If that is indeed the case, then we couldn’t make a better recommendation than the ZoMei Z818 Lightweight Travel Tripod. Wondering what the hype’s all about? We’ll let the features of this amazing travel tripod do the talking and convince you why it’s the best travel tripod in town! 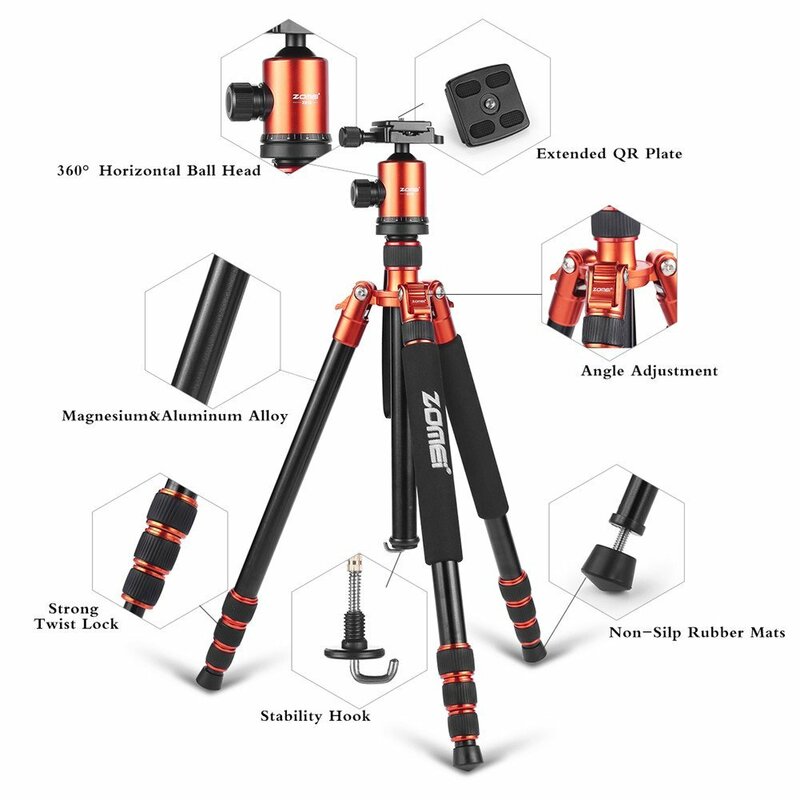 Compact: Since travelers are generally looking for a compact tripod, the Tripod has been designed to ensure that its legs can be inverted and folded back 180 degrees with ease, resulting in an 18” tripod that can be carried around without any problems. Stable: The Tripod comes complete with a column hook that allows increased stability, ensuring that the tripod doesn’t fall over due to a lack of balance. The travel tripod also comes with a separate pan and head locks to ensure that users will be able to make adjustments depending on their needs and requirements. Multi-functional: Owing to a removable center column and tripod leg, the tripod can also be converted into a fully functional monopod if that’s what you prefer. Easy set up: To make travel photography as simple and convenient as possible, the Tripod can be effectively used by screwing the mounting plate on your camera. The design and angles of the Tripod ensure flexibility with photography, allowing you to shoot and take high quality pictures even on irregular surfaces. Convenience: The Tripod comes with four adjustable leg sections that can be used for adjustments of height between 18” and 65”. The camera can also be removed from the tripod with a simple push of a button. Lightweight: Since the Tripod is made of aluminium and magnesium, it is not too heavy or bulky to carry around and can be used in a variety of settings—both indoor and outdoor! The Tripod weigh 3.75 lb / 1.7 kg. Alternatively, ZoMei Z888C Carbon Fiber Travel Tripod offers lighter option and weigh 3.3 lb / 1.5 kg. Why Choose the ZoMei Z818 Lightweight Travel Tripod? The Tripod is the best travel tripod available in the market for quite a few reasons. The travel tripod is not only sturdy and durable, but also comes with adjustable height settings, which allows it to be used in a variety of settings. The design of the Tripod also allows it to be used with great ease on irregular terrains and uneven surfaces. Made with aluminium, the Tripod is also light enough to be carried around and can be set up without any problems making it the best travel tripod for anyone who wants to take high quality pictures to document their travels. Even though the Tripod has a number of features and benefits, it didn’t quite cut it for some people. A few of the users of the Tripod experienced problems with the stability hook and claim that it came undone after the first few uses. Other users were not happy about the fact that the tripod has screw grips for loosening the leg and say that this part should have been worked on a bit more. Despite the fact that some people experienced problems with the ZoMei Z818 Travel Tripod, it offers great value for money. The lightweight and sturdiness of the tripod were particularly praised by people who said that both of these features made the ZoMei Z818 the best travel tripod for anyone who is interested in photography. Additionally, since the ZoMei Z818 Travel Tripod offers stability and convenience, it proved to be a good bargain for a lot of people who were new to photography and didn’t want to deal with heavy and bulky equipment just to take a few good pictures.